Our plan was to use these slides to characterize he throughput of our microscope objectives at different wavelengths. However, because we know that the Hg long arc lamp is not stable, we thought we should take a few exposures of each field. We noticed a trend of decreasing intensity in these exposures. Therefore, we hypothesized that the plexiglass fluorescence might not be as stable as expected. Shutter was opened and images were collected at 1ms integrations times. Each image was measured for mean, min, and max pixel intensities. (No, we didn't measure the background level of the camera, sorry.) The slide was illuminated continuously duing the timecourse. Results show that there is initial rapid bleaching which plateaus. Slide labeled "GREEN ex:FITC or GFP"
Shutter was opened and images were collected at 10ms integrations times. Each image was measured for mean pixel intensities. (No, we didn't measure the background level of the camera, sorry.) The slide was illuminated continuously duing the timecourse. Results show bleaching. However, the initial timepoint of each time series has the same intensity value which means that we can use this slide and only look at the intitial exposure. The problem is, that unlike a solution, the area (or volume) bleached is not going to be refreshed via diffusion. So we have to be careful not to use the same spot twice. A few days later we repeated the experiment with three independent runs for a five and a half minute timecourse and found the same results. The nasty spikes are due to fluctuations of the Hg arc lamp. With the objective noted above on our digital station #4 there is a modest drop in intensity over 5 to 6 minutes continuous illumination of between 2 and 3 percent. I admit that there really isn't much need to subject one of the ref slides to such brutal conditions, but it is worth pointing out that they do bleach. 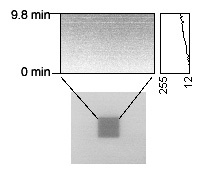 The following figure is from the BioRad Radiance 2000 confocal. Excitation was continuous at 488nm at 100% at a zoom of 6.7X with the Nikon 60X N.A. 1.4 infinity corrected objective. Images were taken over a 9.8 minute period. After the time lapse, the zoom was set to 1X and a single picture was taken of the field showing the bleached square from the 6.7X zoom at the center. At 60X the 488 nm laser line was parked (really a zoom of 99X) for a few minutes at a spot somewhere in the FluorRef slide. Then the laser intensity was turned down to about 15% and zoomed out a Z series was collected. The volume was inverted and projected using the maximum pixel method in NIH-Image. The light areas show the bleaching in 3D. What this graph shows most of all is that a Hg long arc lamp that has been on for less than an hour jumps all over the place (magenta curve) whereas after being left on for more than 6 hours, it is less jumpy (dark blue line). After doing the time lapse, we noticed that there was a ND filter in the excitation light path, so the bleaching can't be compared directly with the results above. And this example has the same ND filters in the light path, but the excitaion and imaging is with a long pass Dapi block.